Sara had been wanting to do a Mardi Gras party for a while, and the number of weekends remaining was dwindling fast. 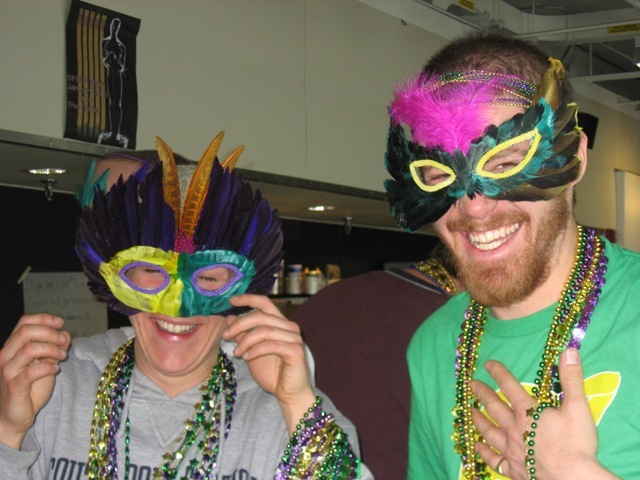 The third and final installment of bingo had already been planned for tonight, but there were no other options, and Sara had already bought all of the Mardi Gras supplies, so we ended up having Mardi Gras Bingo! As it turns out, earlier in the season, Sara, the Welder, had bought two boxes worth of beads and a box of feather masks. She was originally going to throw a big party, but the season was winding down, so she decided to do it tonight after Bingo. 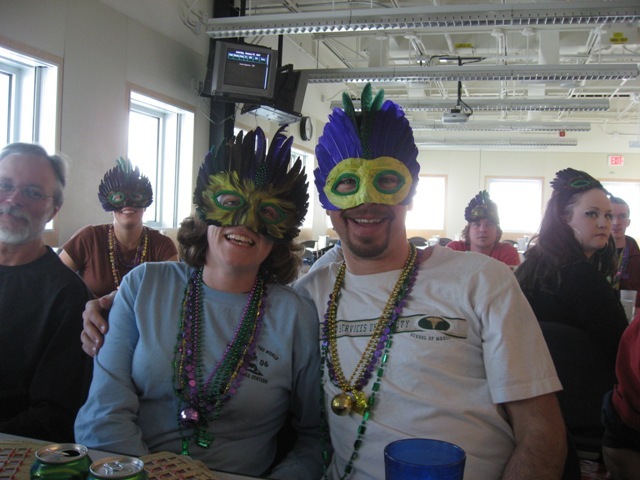 But, as the season was coming to an end, the urge to party had died out in most people, including her, so she decided to just combine bingo and Mardi Gras. Before Bingo started, as people were buying their cards, several of us passed out masks and beads. 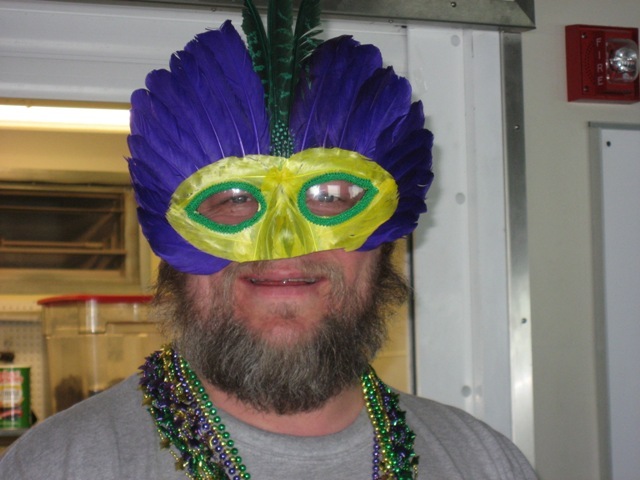 There were several laughs as people put on their masks, but that was just about all there was to Mardi Gras. It was a bummer that she had put so much into it and it didn’t really amount to much. The energy level was much lower than it had been at the first two bingos. But, despite that, following the tradition that I had set the previous Bingo, after one of the rounds, James Brown announced that the next round would be a bit non-traditional. 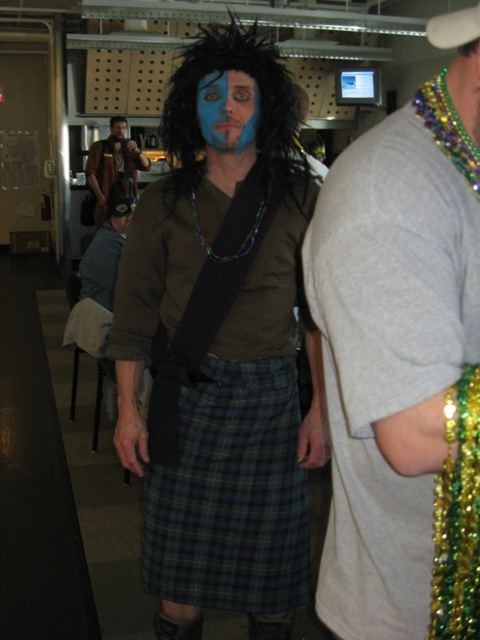 He was dressed up in sort-of-Scottish garb, which was funny to begin with. But at this point, he took off his Scottish sash and ripped off his shirt to a cheer from the crowd. On his chest, a bingo board was painted, and he told everyone that whoever was holding the card that matched the one on his chest was this rounds winner. It was a pretty good twist. Even with the lower energy level, it still turned out to be a fun evening, and it was nice that it didn’t end up with any drunken messes.